Florence is a coastal city in Lane County, in the U.S. state of Oregon. It lies at the mouth of the Siuslaw River on the Pacific Ocean and about midway between Newport and Coos Bay along U.S. Route 101. As of the 2010 census, the city had a total population of 8,466. The Florence area was originally inhabited by the Siuslaw tribe of Native Americans. Some claim that the city was named after state senator A. B. Florence, who represented Lane County from 1858 to 1860; another claim is that Florence was named after a French vessel that was wrecked at the mouth of the Siuslaw River on February 17, 1875. 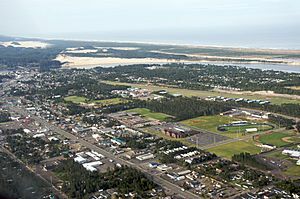 Florence is located on the Oregon Coast at the mouth of the Siuslaw River immediately north of Oregon Dunes National Recreation Area, at about the same latitude as Eugene, Oregon. It is approximately midway between the other major central Oregon coastal cities of Newport and Coos Bay. Florence annexed Driftwood Shores hotel and conference center north of town in Heceta Beach in 2008. 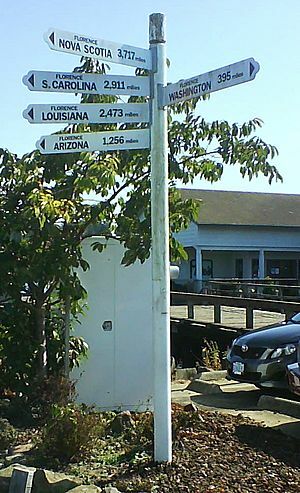 The unincorporated community of Glenada lies just across the Siuslaw on U.S. Route 101 to the south of Florence, and the city of Yachats is 26 miles (42 km) to the north. According to the United States Census Bureau, the city has a total area of 5.87 square miles (15.20 km2), of which 5.30 square miles (13.73 km2) is land and 0.57 square miles (1.48 km2) is water. As of the census of 2010, there were 8,466 people, 4,226 households, and 2,374 families residing in the city. The population density was 1,597.4 inhabitants per square mile (616.8/km2). There were 5,103 housing units at an average density of 962.8 per square mile (371.7/km2). The racial makeup of the city was 92.5% White, 0.3% African American, 1.3% Native American, 1.0% Asian, 0.3% Pacific Islander, 1.4% from other races, and 3.2% from two or more races. Hispanic or Latino of any race were 5.4% of the population. There were 4,226 households of which 15.8% had children under the age of 18 living with them, 43.7% were married couples living together, 9.2% had a female householder with no husband present, 3.3% had a male householder with no wife present, and 43.8% were non-families. 37.0% of all households were made up of individuals and 21.9% had someone living alone who was 65 years of age or older. The average household size was 1.98 and the average family size was 2.51. The median age in the city was 57 years. 13.9% of residents were under the age of 18; 5.9% were between the ages of 18 and 24; 15.5% were from 25 to 44; 28.4% were from 45 to 64; and 36.4% were 65 years of age or older. The gender makeup of the city was 46.4% male and 53.6% female. Per the census of 2000, there were 7,263 people, 3,564 households, and 2,145 families residing in the city. The 2007 population estimate is 8,270. The population density was 1,476.3 people per square mile (570.0/km²). There were 4,174 housing units at an average density of 848.4 per square mile (327.6/km²). The racial makeup of the city was 95.88% White, 0.28% African American, 0.92% Native American, 0.55% Asian, 0.14% Pacific Islander]], 0.56% from other races, and 1.67% from two or more races. 2.37% of the population were Hispanic or Latino of any race. There were 3,564 households out of which 16.9% have children under the age of 18 living with them, 48.6% were married couples living together, 9.3% had a female householder with no husband present, and 39.8% were non-families. 34.4% of all households were made up of individuals and 21.7% had someone living alone who was 65 years of age or older. The average household size was 2.02 and the average family size was 2.52. In the city, the population dispersal was 16.8% under the age of 18, 5.0% from 18 to 24, 16.0% from 25 to 44, 23.9% from 45 to 64, and 38.2% who were 65 years of age or older. The median age was 56 years. For every 100 females there were 84.8 males. For every 100 females age 18 and over, there were 82.1 males. The median income for a household in the city was $30,505, and the median income for a family was $36,784. Males had a median income of $30,962 versus $23,878 for females. The per capita income for the city was $18,008. 14.4% of the population and 10.0% of families were below the poverty line. 25.9% of those under the age of 18 and 8.3% of those 65 and older were living below the poverty line. Florence has hosted the Rhododendron Festival annually since 1908. The Siuslaw Pioneer Museum is located in a historic 1905 schoolhouse. 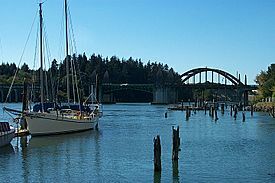 Old Town Florence is located on the Siuslaw riverfront. 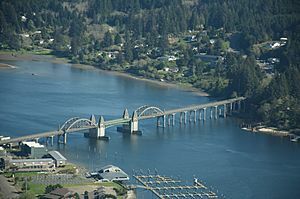 The Port of Siuslaw marina is to the east, and the Art Deco 1936 Siuslaw River Bridge is to the west. The boardwalk promenade was built along the marina to improve the area. Many businesses are on US101 itself, which runs through the town, north to south. North of Florence on U.S. Route 101 are the Sea Lion Caves, a tourist attraction that features a sea cave that is the year-round home of a population of Steller sea lions. Historic buildings on the National Register of Historic Places in the Florence area include the Edwin E. Benedict House, a deteriorating house on the Siuslaw River that is said to have been Ken Kesey's inspiration for the Stamper House in his novel Sometimes a Great Notion, Heceta Head Lighthouse and Keepers Quarters, Jessie M. Honeyman Memorial State Park Historic District, the Siuslaw River Bridge, and the William Kyle and Sons Building in Old Town. There are several parks and other sites managed by the Oregon Parks and Recreation Department near Florence, including Darlingtonia State Natural Site and Heceta Head Lighthouse at Devil's Elbow to the north, and Jessie M. Honeyman Memorial State Park to the south. 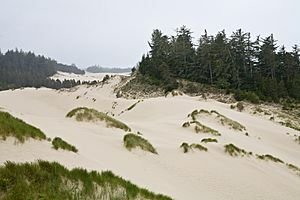 The Oregon Dunes National Recreation Area, managed as part of the Siuslaw National Forest, begins south of Florence. Yamagata, Japan - Yamagata-shi was established in 2003 by the merger of Ijira (Florence's former sister-city), Takatomi, and Miyama. Florence, Oregon Facts for Kids. Kiddle Encyclopedia.